Hey! I can't believe October is almost over! Where does the time go?? Well, I am back with another amazing Degusta Box USA. 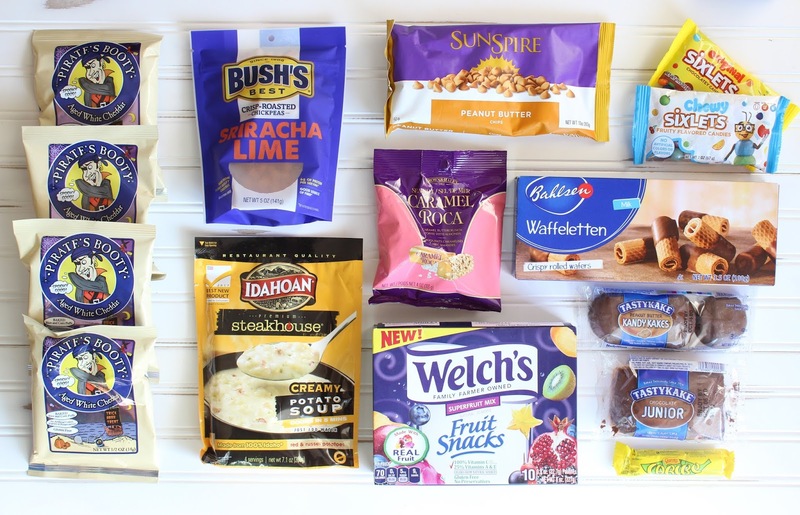 This month contained 12 yummy products. Lots of snacks, lots of savory goodies. Degusta Box USA is one of the best snack boxes out there. It's always loaded with great products, all of which are a complete surprise each month, and its only $19.99 a month! Brown & Haley Sea Salt Caramel Roca Buttercrunch are made with caramelized fresh butter, sugar, almonds from California, signature cocoa beans and a dash of sea salt. These candies are really sweet and crunchy. I love the silkiness of the chocolate and the sweetness from the caramel. The touch of sea salt gives these a nice balance of savory and sweet. Pirate's Booty tasty rice and corn puffs are made with real aged white cheddar cheese. These yummy cheese puffs are baked, never fried. And, they are made without any artificial ingredients, colors, flavors or preservatives. My kiddos love these! Any snack that they can crunch on and make a cheesy mess, they love. We have had several cheese puffs but these are by far our favorite! The cheese flavor on these is so flavorful! Bahlsen Waffeletten Milk Chocolate Wafer Rolls are thin Belgium waffles dipped into the richest European milk chocolate. These are the best! I absolutely love these waffle rolls. They're flavorful, crunchy and the chocolate is delicious! I only wish that they were in a store near me. By far my favorite product this month! Sixlets Candies are nut-free and gluten-free. This months box contained chocolate sixlets and fruit sixlets. The chocolate sixlets have been around since I was a kid. I always remember getting them as a trick or treat candy. The fruit sixlets are new to me and I must say, they are really good! And fruity! SunSpire Peanut Butter Chips are made with real peanut butter. These delicious little chips are great for baking or snacking. I love melting some of the chips and pouring it onto my ice cream! Bush's Best crisp-roasted Chickpeas are high in fiber. They are great for on-the-go snacking as well as for adding to soups or salads. These little chickpeas are so crunchy and I love their taste. A healthy snack that I love to munch on. Garoto is a snack bar that is filled with delicious banana filling and coated with milk chocolate. I couldn't put this snack down! The banana and chocolate go so well together. Tastykakes are baked fresh! The Chocolate Junior has been a staple since 1917. This yummy cake is coated with a delicious chocolate. The Peanut Butter cake is made with a snack-sized vanilla sponge cake, a thick strip of peanut butter and coated with milk chocolate. This was my first time having these cakes! They were really good! Moist and a great after dinner dessert. Welch's New Fruit Snacks are made with superfruits. Welch's made great flavor combinations including pomegranate-passionfruit, starfruit-kiwi, dragonfruit-blackberry, acai-blueberry and goji-apricot. My son loved these! As I was taking photos, he had two bag! We are a huge fan of Welch's fruit snacks! Idahoan Foods Creamy Potato Soup is filled with real red potatoes and real red potato skins. This hearty soup taste just like homemade potato soup. This is an easy, delicious soup that can be made in minutes. It's really good! It's full of delicious potatoes and its so creamy. October's box wasn't as packed as September's box, but it still was an amazing box. Every single product this month was new to me. And I really enjoyed every one of them. Especially the peanut butter chips and waffeletten! Stay tuned for next month- I will be running a giveaway! SUBSCRIBE to Degusta Box USA today and your first box will only be $12.99! Hey! Raise your hand if you love cheese?! I mean, who doesn't? Well, if you are a cheese lover, you will love Intakt's Cheese Lovers Snacks! Intakt Snacks makes a delicious cheese snack that is crunchy and made with 100% real cheese! Intakt's snacks are free from artificial ingredients and preservatives. Their cheese snacks come in 4 yummy flavors: Original, Spicy, Oregano & Mozzarella Blue Cheese. The ingredients that are used to make their snacks come from southern Chile. The snacks are dried, via innovative technology, at a low temperature to preserve nutrients. Made with soft southern Chilean mozzarella and blue cheese. Mozzarella and blue cheese are 2 of my favorite cheeses. These are amazingly good and have a real sharp taste! Ingredients: Cheese mix [pasteurized cow’s milk, milk protein (milk), salt, microbial enzyme, citric acid, calcium chloride, lysozyme (egg), cheese culture (St. Thermpophilus, Lactococcus lactis susb, Cremoris, Penicillium rqueforti)]. Made from a soft, buttery cheese from southern Chile. The original flavor has a real buttery taste. The original flavor goes well with grapes! Ingredients: Chilean buttery cheese [pasteurized cow’s milk, milk protein (milk), salt, calcium chloride, lysozyme (egg), microbial enzyme, cheese culture]. Made with a buttery cheese and infused with merken -an indigenous spice made from smoked red chilies, goat horn and coriander seeds. This flavor is spicy for sure! I love a spicy cheese! Ingredients: Chilean buttery cheese [pasteurized cow’s milk, milk protein (milk), salt, calcium chloride, lysozyme (egg), microbial enzyme, cheese culture], Chili, Coriander seeds, Cumin, Salt, Oregano. Made with a soft, buttery cheese from Chile and oregano. I love the oregano flavor that's infused inside of this cheese snack. The oregano really gives the cheese a great flavor. Ingredients: Chilean buttery cheese [pasteurized cow’s milk, milk protein (milk), salt, calcium chloride, lysozyme (egg), microbial enzyme, cheese culture], Oregano. These little cheese nibbles taste just like cheese. Besides the crunchiness, there is no difference in flavor from a normal slice of cheese. The cheeses that Intakt uses are so good. They each have an amazing, creamy flavor. I love enjoying my cheese snacks with a glass of wine or with some crackers. If I was asked to pick a favorite flavor, I wouldn't be able to. I really love all 4! I also love their crunchiness! Intakt Snacks are available for purchase on Amazon! Grab 8 bags (2 of each flavor) for only $26! Hey, all! Happy Monday! I love a nice, relaxing bath. Especially if that bath contains an awesome smelling bath bomb. Bath Bombs are so popular nowadays that I don't even know which ones to try. When I found out that there is a new subscription box that delivers some right to my door, I was extremely excited! Scents Monthly is a monthly subscription box that contains premium bath bombs! Each month Scents Monthly sends out a curated selection of bath bombs as well as a special mystery product! My first Scents Monthly box contained 4 bath bombs, a bar of soap and a branded pop socket. The bath bombs are huge! I got 2 different scents in this box. Not sure what scents they are, though. It would have been nice if they were labeled with its scent or ingredients. I know that this is a fairly new subscription box so information on each product might be in a later box. The white bath bomb has a rose smell to it. It's very floral and strong. If I look closely at it, I can see that there are bits of dried roses inside the bath bomb. After looking online, I found out that this one is the White Rose Shea Butter bath bomb. The green bath bomb has a vanilla scent to it. This one has a much lighter scent to it. I really like it! After looking online, I found out that this is the Green Vanilla Shea Butter bath bomb. It turns the bath water green! How cool! The colorful bar is a Rose Essential Oil Face and Hand Soap bar. This bar is great for moisturizing and cleansing. It has a light rose scent. I use this to wash my hands and I love it because it's oils leave my hands super soft. Isn't this pop socket cute? I love how it has the Scent Monthly logo on it! My son stole it from me, lol! This is a wonderful subscription box. The bath bombs dissolve quickly and leave my bath smelling amazing. They do leave a little residue on my bath tub, but nothing that I can't wipe up quickly. The hand and face bar is wonderful! The little added gift is very thoughtful. I mean, who doesn't love a pop socket! Scents Monthly is a great gift for those who love a nice, scented bath. What do you like to add into your bath? Bath bombs, oils, Epsom salt? Leave me a message in the comments below! Pink Pumpkin Coffee for Breast Cancer Awareness Month + Giveaway! Hello! As we all know, October is Breast Cancer Awareness Month. All month long, we dedicate everything to help find a cure for this yucky cancer. I am amazed by how many amazing companies help raise awareness. I have the privilege to work with one of these amazing companies this month and that company is Brooklyn Bean Roastery. Brooklyn Bean Roastery makes a special, limited edition coffee called Pink Pumpkin and its only available for the fall months. A portion of Pink Pumpkin's proceeds go to Breast Cancer Awareness. Thank you, BBR! I personally do not know of any family members who have or have had breast cancer, but I know that this terrible cancer hits home every day. Pink Pumpkin is a smooth, flavorful coffee. It is the perfect coffee for a fall day. When brewing a cup, my home is filled with a nutty smelling coffee with hints of vanilla and pumpkin. This coffee differs from other brands because it actually tastes like a pumpkin pie! The pumpkin flavor is not overpowering and I find myself enjoying every last sip. Pink Pumpkin is a coffee that can be enjoyed both hot and cold, with or without sugar and with or without creamer. I love adding a bit of pumpkin spice creamer to my cup to give my pumpkin coffee more of a creaminess. Pink Pumpkin is definitely my go-to coffee for the fall months because it helps kick off this beautiful, festive season. All of Brooklyn Bean Roastery's coffees are made with high quality Arabica coffee beans. The single serve cups work well and are compatible with all Keurig machines. 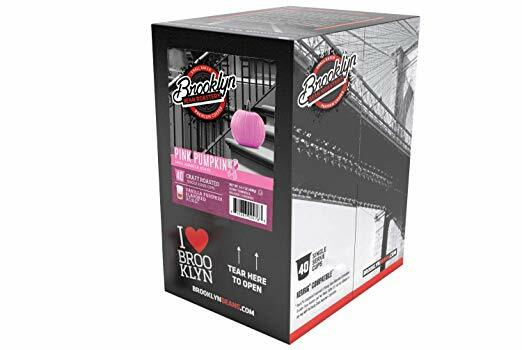 Pink Pumpkin and all of Brooklyn Bean Roastery's coffees are available for purchase on Amazon. Enter to win a 40 count box of Brooklyn Bean Roastery's Pink Pumpkin Coffee! Ends October 31, 2018, at 11:59 pm EST! Winner will have 48 hours to confirm their win. Prize will be fulfilled by Brooklyn Bean Roastery. Only one entrant per mailing address, per giveaway. Good Luck! AND, click HERE to win Sinful Cinnamon Coffee! If you are an Honorary Brooklynite, Blogger or affiliated with Two Rivers Coffee for any type of reviews, you are not eligible to enter. Only those 18 years and older are eligible to win. Winners must live in the continental United States. Only one prize per household, per 90-day period. Java Factory Roaster's Sinful Cinnamon Coffee Review + Giveaway! Hi there! It's almost Halloween, all. And, you know what that means? Cold, crisp fall air while Trick or Treating. There is nothing better than strolling along with my Trick or Treaters while enjoying a hot cup of coffee. 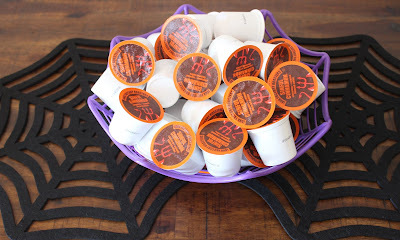 Which coffee do I rely on for this spooky fun-filled Halloween night? Sinful Cinnamon from Java Factory Roasters! It's a great way for my husband and I to stay warm while my boys collect their candy. Grab this limited edition fall flavor today and brew yourself a cup (or a thermos full)! Happy Halloween! Sinful Cinnamon Coffee is made with 100% Arabica beans, cinnamon and caramel. Smelling Sinful Cinnamon while brewing really gets me into the Halloween spirit. This coffee has a floral and nutty aroma when brewing and it makes my home smell "sinfully" good! It gives off notes of spicy cinnamon and smooth, buttery caramel. Cinnamon and caramel are two ingredients that I love, especially mixed together. I enjoy drinking Sinful Cinnamon with a hint of cream and sugar. I don't like to add a lot to my cup because I don't want to take away the delicious flavor that this coffee has. Sinful Cinnamon is a delicious medium roast coffee. Java Factory Roasters Coffee K-cups work well and are compatible with all Keurig Coffee Machines. Java Factory Roasters has an amazing selection of coffee. Can't decide which JFR coffee to try? Grab a variety pack! Or choose from one of their special, limited edition seasonal flavors. Want to win a 40 count box of Sinful Cinnamon? Enter below! Or, if you'd rather not wait, order Sinful Cinnamon from Amazon today! 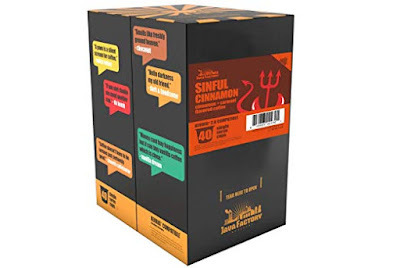 Enter to win a 40 count box of Sinful Cinnamon Coffee from Java Factory Roasters! Ends October 31, 2018, at 11:59 pm EST! Winner will have 48 hours to confirm their win. Prize will be fulfilled by Java Factory Roasters. Only one entrant per mailing address, per giveaway. Good Luck! AND, click HERE to win some Pink Pumpkin Coffee! Hey! September's Sleek Treat Subscription Box is once again full of amazing snacks. This month's "Harvest Moon" box contained 9 yummy snacks. Sleek Treat's subscription box always allows me to eat healthy and to put low sugar snacks into my son's lunch box. All of the snacks are great for those who are diabetic or for those who are on a low sugar diet. I know a few people who are diabetics and I know how tough it is for them to find low/no sugar snacks. Sleek Treat works hard each month to find delicious snacks for their subscribers! I love how each box had a little insert that shows all of the snacks. It also gives me nutritional information, too! Smart Baking Co. Cinnamon Smartcakes are yummy, flavorful and moist. These Smartcakes are loaded with healthy Omega-3 fatty acids and vitamins. I love how these are covered with cinnamon on the top. These little cakes are SO light and airy. They pair well with a hot cup of tea or coffee. Sencha Naturals Green Tea+C Drink Mixes contain 10mg of caffeine. These drink mixes contain whole leaf green tea, acerola cherry and supporting herbs to help you stay well. September's box contained 2 flavors: Original & Dragonfruit/Pitaya. I really liked the effervescence that these had. Great for when having a cold. The original flavor was my favorite. Nush Foods Blueberry Cakes are truly bursting with blueberry flavor. Nush Cakes are soft, moist and have a cake-like texture. This Blueberry Cake is packed with yummy blueberries! I have had Nush Cakes before and they are one of my go-to snacks. They are very filling! Intakt Cheese Lover Original Cheese Snacks are made with Soft Buttery Cheese. These cheesy bites resemble the moon's surface. Intakt Cheese Snacks are dehydrated which leaves them super crispy! I love this savory snack. These little cheese crisps pair well with a sandwich. But, I enjoy eating them by the handful! Noosh Almond Butter had 3 of their products in this month's box. Original, Cupcake and Coffee Almond Butter! Noosh's almond butter recipe is simple and all-natural. It's made with real California Almonds. This was my very first time trying these almond butters. I really enjoyed the Cupcake flavor. Noosh's Almond Butter is smooth and creamy. They have a wonderful taste to them. One of the best almond butters that I have ever had! Quest Maple Waffle Protein Bars are sweet and have a gooey maple syrup flavor. These protein bars make a great breakfast. This protein bar tastes just like a buttery, syrupy waffle. I love it's chewy texture and I love how it doesn't have that sweetener aftertaste to it. ThinkThin Protein Cakes have a sweet vanilla flavored center, white frosting and topped with colorful sprinkles. ThinkThin Protein Cakes are high in protein and are made with premium ingredients. This protein bar tastes just like a vanilla protein shake. The white frosting pairs so well with the chewy vanilla center. My sons loved them! Sleek Treat always contains the best low/no sugar snacks. 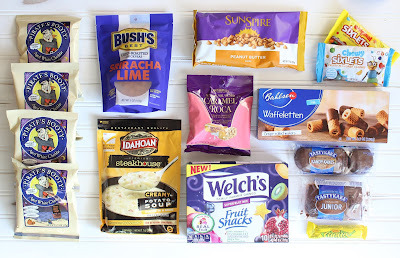 Most of the snacks in September's box were new to me and a few of the snacks I have had before. All-in-all, the featured snacks were all really good. Snacks that I feel comfortable giving to my family. Especially my kids because they aren't loaded with sugar. My favorites from September: Noosh's Cupcake Almond Butter, Nush Foods' Blueberry Cake, ThinkThin Protein Cake and Intakt Snacks Cheese Snack. September's Sleek Treat offered a great variety of sweet and savory snacks. This is a subscription box that I highly recommend! SUBSCRIBE to Sleek Treat today!